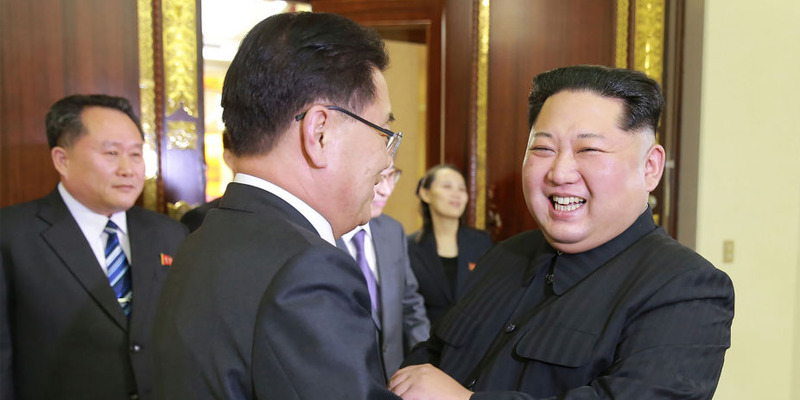 STR/AFP/Getty ImagesIn this March 5, 2018 photo, North Korean leader Kim Jong-Un (R) shakes hands with South Korean chief delegator Chung Eui-yong (C), who travelled as envoys of the South’s President Moon Jae-in, during their meeting in Pyongyang. Kim Jong Un said North Korea would “refrain” from further missile or nuclear testing. The message was delivered in Washington by South Korea’s chief envoy that met with Kim earlier this week. North Korea launched nearly two dozen missiles last year, including a one that could theoretically reach the continental US, and completed its sixth nuclear test. In doing so North Korea said it had achieved its goal of becoming a nuclear state and has not launched a missile since, so its new pledge may be unsurprising. North Korean leader Kim Jong said he would “refrain” from further nuclear or missile testing in a historic message to US President Donald Trump. 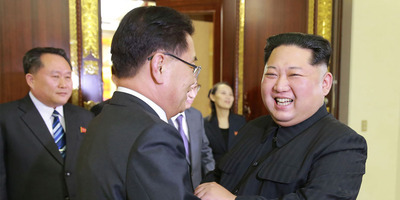 South Korea’s chief envoy, and head of its national security office Chung Eui-yong, met with Kim earlier this week in Pyongyang, and relayed a message from Kim to Trump on Thursday. Chung also highlighted that North Korea appears to have abandoned its previous stance on missile tests, which were often conducted after military drills on the Korean Peninsula which Pyongyang saw as acts of aggression. But Kim’s willingness to pause parts of North Korea’s weapons program may not actually be that surprising. In September 2017, Pyongyang conducted its sixth nuclear test shortly after state media ran pictures of Kim inspecting what was reported to be a hydrogen bomb. And all up last year, North Korea tested 23 missiles and, in November, launched its most powerful missile ever, the Hwasong-15. Mathematically, it is possible for that missile to reach the United States mainland. North Korea does not appear to have launched a missile since. Trump said he would meet Kim as soon as this spring “to achieve denuclearization,” but the White House later said that a time and date had yet to be determined.